To celebrate the Warriors' 2017 NBA championship we are pleased to announce the release of this Commemorative Championship Game White Panel Ball and Custom Display Case Set. The ball comes with special panels that feature the Warriors' championship logo, a list of the franchises' championships, and series summaries of the 2017 NBA Playoffs. 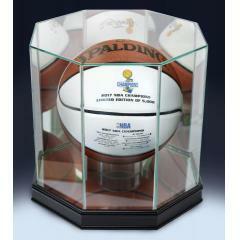 The ball comes with a beautiful Custom Display Case. The Warriors made the playoffs look easy, sweeping each series on their way to a Finals rematch with the Cavaliers. Unlike last year, the Warriors proved to be too much for their Eastern Conference opponent and ended 2017 as Champions of the NBA. To ensure we reserve a ball and display case set for you we will charge your credit card for the full price immediately upon taking your order. We will confirm your order by Email. This ball is not game used. Please allow 4 to 6 weeks for delivery. 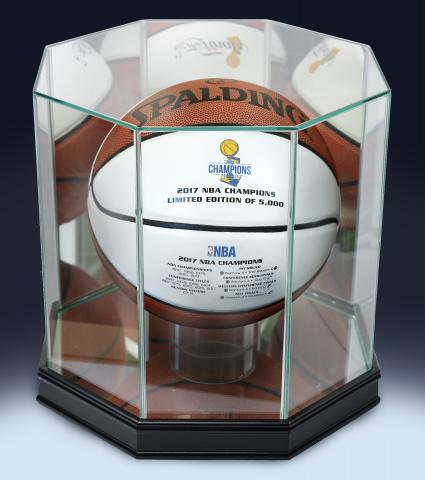 Warriors 2017 NBA Champions Spalding White Panel Ball & Display Case $179.95 Sold Out!